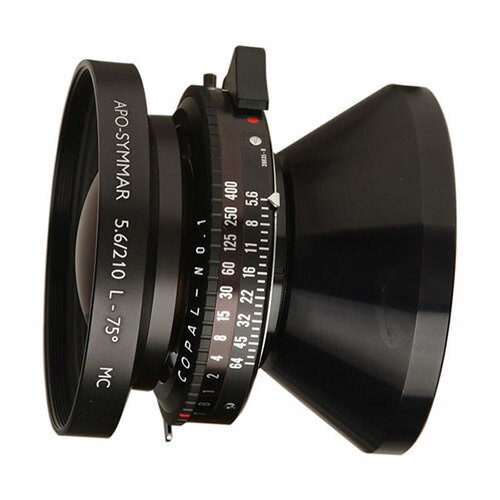 Lens Description: The Schneider 210mm f/5.6 Apo-Symmar L Lens is a slightly-long, all-purpose large format lens which gives the highest image reproduction quality possible in a broad range of applications. This lens is for use with 4x5 cameras or 5x7 cameras, and is ideal primary lens for those who prefer a somewhat longer focal length as their standard lens; upon 4x5, it renders a field of view similar to that of a 55mm lens upon a 35mm camera. The 75° angle of coverage permits generous shifts on both the 4x5 and 5x7 formats, which is very useful in architecture photography. It uses 77mm filters and has an 80mm diameter rear barrel, so it can be used with field cameras such as the Linhof Technika.